Here he comes to save the day! The massively muscled mini superhero Mighty Mouse is set to make an appearance on the big screen. We have just learned that writers Jon and Erich Hoeber, who wrote The Meg, have been chosen to write the screenplay for our mighty hero. 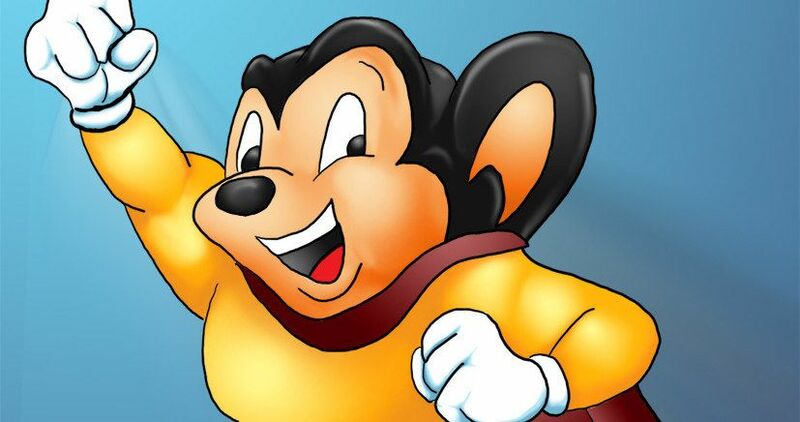 Mighty Mouse was conceived by Isadore “Izzy” Klein. The character was originally a Super Fly adopted by Paul Terry (of Terrytoons) later turned into a Super Mouse. The flying rodent, introduced in 1942, got his name by starting off as a parody of Superman. Just a year later in 1943, 20th Century Fox altered the cartoon again, this time changing from Super Mouse to the still used moniker Mighty Mouse. Who could forget his iconic theme song/mantra “Here I come to save the day”? Andy Kaufman who gained his notoriety as a stand up comic, used to do a really great bit that included the unforgettable tagline to great audience response. The theme song became a household staple when the cartoon entered the Saturday morning cartoon lineup in 1955. Like most long running shows, the adventures and heroics of the Mighty Mouse grew stale, causing the show to go out of vogue. In 1987 famed animator Ralph Bakshi did a remake of the cartoon entitled: Mighty Mouse: The New Adventures. There have been numerous pitches made to bring Mighty Mouse to the big screen. Paramount Pictures and Nickelodeon Studios were hot after the property but the pitched projects never took hold. However in these times of superhero movies pulling in a billion dollars plus, Paramount animation is banking on the American comic book hero by creating a new feature film starring the ever present miniscule mouse. In these days of advanced movie making techniques, we will get to see the movie makers flex their muscle in the form of a live-action animation hybrid. With the incredible abilities of CGI, we can only imagine how the mash up will look, but we know it will look damn good. With the news of the Hoeber brothers getting on board to write the script, we also know that the movie will be packed full of adventure and excitement. They have already done a bunch of work together with The Meg being one of their more recent ventures. Jason Statham starred in that underwater monster movie which grossed almost $50 million in it’s opening weekend. With the more than impressive box office haul of their last film, coupled with the perennial popularity of Mighty Mouse, it looks like the Hoebers will add another box office money maker to their stable of films. As the Mighty Mouse project comes to life we will hear more and more about the film, including an official title, assigned director, etc… The live action actors for the film become very important in the hybrid genre as their star power has a tendency to drive more interest to these types of movies. Reviving an animated series for the big screen has been hit or miss over the years, but with Mighty Mouse crossing over into the superhero category, it may be a little easier for him to take off into box office success. This news comes from Deadline.